Down to the depths, banished forever, in the land of pain and suffering -- this is where you will find the Alpinestars Hades Jacket! Well, not exactly. Designed in Italy, made by Alpinestars, and part of the Black Shadow Collection, the name "Hades" conjures up ominous images of fire, brimstone, and certain death. Keep in mind, all these things are possible aboard a motorcycle, given enough speed and reckless abandonment! However, certain death is less likely to befall you if you are wearing the Black Shadow Hades Jacket. The Black Shadow collection is all about muted tones, blackened details, and murdered out style. Everything, from the Alpinestars logo, to the stretch panels at the underarms, to the TPU shoulder sliders is black. 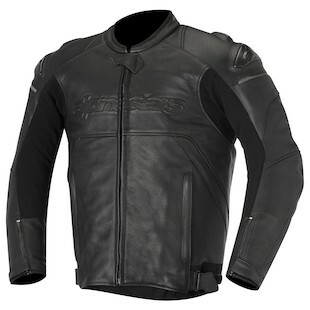 Akin to the Black Shadow Huntsman jacket, but with a sport inspiration, the Alpinestars Hades would fit in great with the darkened carbon-fibre tones of the Ducati Diavel, or the classic lines of the Harley V-Rod Nightster. If you ride an R1, we'll still let you buy one, but at that point you get into the Black Shadow Phantom territory. Whichever way you slice it, one of the Black Shadow jackets is bound to fall on your plate. Its the type of thing we all love to see from Alpinestars. Black never goes out of style.